Hi all and welcome to another week on the Simon Says Stamp Challenge. Thank you for joining us for the Back to School Challenge and we hope you will all join us again this week too. This is my take on the challenge using Hero Arts stamp sets and dies. I started with die cutting some masking paper using the dog die from Cute Baby Animals Stamp and Cut from Hero Arts. I adhered these masking paper die cuts randomly on a white cardstock panel making sure I burnish and smoothen the edges. Then I sponged Tumbled Glass distress ink over the entire cardstock panel. Once the distress ink was dry, I removed all the masking paper die cuts. This left me with dog shaped spots on which I stamped the dog image also from the Cute Baby Animals stamp and cut from Hero Arts. I used versafine Onyx Black ink to stamp the dog images. Black ink gave me a nice contrast against the blue. I filled in the gaps by stamping the sentiment “you” and the heart shape also from the same stamp set. With the dog images, I was on the fence on whether to colour or nor to colour. I ended up colouring not the entire image but certain bits of it with neutral colours. 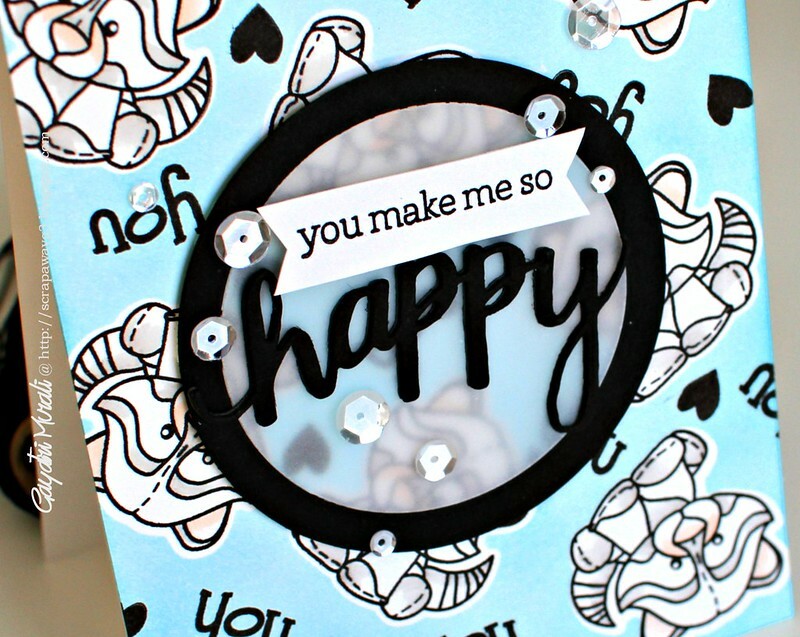 For the focal point, I die cut three “Happy” from Happy stamp and cut from Hero Arts. I stacked and glued them. I stamped the smaller sentiment from the same stamp set on a strip of white cardstock, trimmed fish tail ends. I adhered the sentiments on a vellum circle which is framed with a black circular frame. Finally, embellishing with Sparkly Clear sequins from Pretty Pink Posh brought the card together. What an awesome card! The light-toned background all stamped and colored looks fantastic with the muted shaker portion!! Love this card!! Beautiful background..
Beautiful card Gayatri! Love the great design and that super cute background!! A gorgeous card Gayatri, I love your fun stamped background and a super colour combo………your die sentiment in the circle is fabulous!! I like the coloring book look of the stamped images Gayatri, such a cute card! Gorgeous card Gayatri! The images are so cute and I love how the black die cut really pops! so very cool, great design! hope your weekend is awesome! This is so BEAUTIFUL! I need to say also…ADORABLE!! Wonderful! I love these colors and especially love the vellum and sequins! Thanks so much for sharing! Such a fun card with your repeated puppies in the background, Gayatri! Just love the pretty blue and the circle of happy!